Mandarin-speaking residents of the Onehunga area have seized the opportunity to gain confidence in using local services thanks to a new initiative at their library. The Onehunga Library Anju Chinese club. 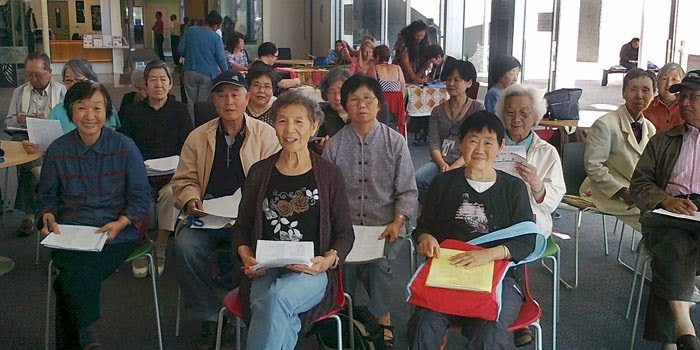 Onehunga Library’s Anju Chinese club started in August 2013 thanks to librarian Annie Cui. "We decided to develop a programme around our service offer to the growing Chinese community in Onehunga," Annie says. "My initial thought was around promoting the Chinese collections and e-Resources relevant to Chinese customers. But upon discussions with some of the Chinese community members, this focus quickly changed. "The Chinese community, mainly elderly, wanted not only to connect with the library, but also to learn basic daily English so they can connect better with the local community and contribute." The group meets twice a month and is mainly aimed at Chinese-speaking customers, particularly older people, and consists of organised discussions around different topics. To begin with, Annie coordinated a double session about the language and jargon used in banks. In session one, she collaborated with Chinese-speaking staff at the local ASB Bank to conduct a session that explained bank and finance-related terms to the group. an ATM machine to Onehunga Library customers. 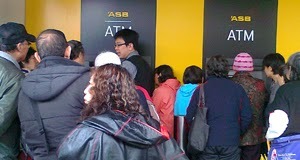 In the second session, she took the group to the local ASB Bank and the session was hosted by a Chinese-speaking staff member. He conducted a tour around the bank, explained what services are offered, took the group to the counter and carried out a role-play to explain what happens in certain scenarios. In later sessions, Annie covered library services and language used in libraries, as well as medical services and visits to a medical centre. So far, each session has had an average of 40 participants and has received extremely positive feedback and interest from customers. "The library is actually part of the society. Onehunga Library’s Anju Chinese club offers a valuable gateway into a new life in a new country," says Terry Liu. "We could not find these classes elsewhere," says Zhipin Li. "These classes fill in gaps left by other English classes. It is close to life, free of pressure, free cost, and offers chance to practice." Annie’s Anju Chinese club is just one of a rapidly growing range of Mandarin-language events and services offered at Auckland Libraries. Community libraries in areas such as Glenfield and Birkenhead are leading the way in the development of collections and events tailored for Chinese migrants to Auckland, as well as speakers and students of the Mandarin language. Annual Lunar New Year celebrations are the focal point for Chinese services at Auckland Libraries, and successive years have seen a steady growth in the number of customers who are keen to participate in this popular cultural festival. Check out the range of Mandarin-language events at Auckland Libraries. Find out more about our Chinese language collections.